Dominique's floating workshop is located in Tyrrel Bay. This is an institution among cruisers in the Caribbean, recognized both for good quality, reasonable prices, and a pleasant ambiance. We got Yum-Yum a couple of wind generator poles custom built and fitted during our two day stay in Tyrrel Bay this time. The Carriacou stop also included a night at Sandy Island and provisioning and check out in Hillsborugh. The Immigration officers could absolutely not understand why the lady figured as Captain in our papers, and I had to explain to them that this arrangement came with certain benefits for Yum-Yum's boatsman. At this point the ambiance in the office changed from deep cultural confusion to masculine coherency, and we were dismissed from Immigrations Hillsborough, Carriacou and Grenada with cheerful greetings. Valentine had read an interesting article in the Compass (a cruiser's magazine) about a woman who had her existence changed from tragedy to success in establishing an extended family business beach restaurant on Myreau. Followed by an hour good sailing before arriving in astonishing Salt Whistle Bay north on Myreau. In the Grenadines we find a few photogenic prototypes of Southern Ocean Paradises like this. And Debbie's beach shack restaurant turned indeed out to be an extended family business, with children, dogs and cats everywhere, and a lot of people that were some kind of associated members of her crew, with unspecified functions like filling up the hammock. Next morning we were awakened by heavy smoke from the clean-up fires on the beach. Burning things is really a national sport not only on Grenada. We packed our walking gear in waterproof bags and swam to the beach. When we came back from our south Myreau expedition a couple of hours later, the smoke was still thick in the bay, and boats were escaping one by one. We decided to have our lunch in open waters, and set course for Bequia. As we (read Tor) is working hard to finish a big USA shopping shipment to catch up with us on St Martin, we need frequent e-mail contact these days. We prefer to stay outside of the most populated anchorages because we enjoy swimming in clear water. And cruisers are -sorry to say- on a regular basis not obeying the rules for waste disposal. It is impressive, though, that we always seem to be able to connect to some open wifi connection everywhere. So also at Tony Gibbon's Beach far out in Admiralty Bay. The badminton conditions were excellent. We have tried before, without luck to reach the famous turtle sanctuary northeast on Bequia. Since it seems to be the custom on this island only to do business with tourists that are willing to pay the equity of the island's annual budget for a tomato or a taxi-trip, we once again started to walk, but this time in the right direction. Then it was Valentine-transport-logistic-magic-time again. As I was busy polishing up her English with the fine nuances between hitch-hiking and hi-jacking in the English language, she must have been performing some very effective hand movements behind my back. Before I really understood what was happening, I found myself next to a very advanced video camera in the back of an English TV-producer's car. On it's way to the turtle sanctuary, of cause. This sanctuary is an unique institution. They take in baby turtles that have had a bad start, and prepare them for a better return to natural life after a sanctuary stay. In addition to the over 900 turtles that has been placed back in natural surroundings, the facility hosts some individuals that would not stand a chance in wild life conditions. On Bequia we also reconnected with Michel and Mireille, a cruising couple that we had the pleasure of meeting on Martinique in early February when we were around looking at boats for sale. It was them who inspired us to look into the possibility of doing our St Vincent stop from own boat. We were set on leaving Yum-Yum behind in Bequia for a day, and take the ferry over for a little St Vincent exploration. The island has a very bad reputation among cruisers, and a lot of people have had bad experiences there. 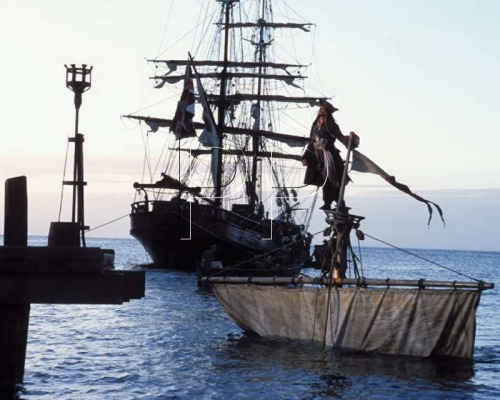 Being one of the the main locations for the Pirates of the Caribbean-movies, this place has a lot to offer. Before we left Bequia, we made a pre-arrangement with the Wallilabou Restaurant and Hotel by phone. They set us up with a reserved mooring, and a rope-handler and guide named Speedy. Just as expected, as soon as we approached St Vincent, small boats came swarming to offer us guiding and mooring-aid. The island has a steep coastal shelf, and normal anchorages are hard to find. The procedure is to anchor on the shelf, back towards land, and finish with a land-line from the stern of the boat. This give a fairly safe mooring, but also a binding to land which boat people dislike, and a great business opportunity for local helpers. And having worked their way out to the approaching visitor's yacht, they hardly take a no for a no. It seemed that everybody knew Speedy though, and didn't want to interfere with his business. So we had a relatively clear an undisturbed entrance into the small Wallilabou Bay. We were also relieved to see that this morning no pirates was dangling from the natural Rock Arc. The film set artifacts are all over the place, and I was happy that evening to find the sinking-ship mast from witch Jack Sparrow enters the dock of Wallilabou in the first scene of the first movie. Just next to our table. The restaurant was fine, but the best part of this stop was a good two hour hike with Speedy in the hills. This is plantation land that has been split up and handed over to local small scale farmers. On our little excursion we found variations from well kept farmland to absolute rain forest. At a certain point up in the woods we observed that Speedy became alert, and guided us over on a sidetrack that we wouldn't have been able to follow without guide. In those back-hills operate the outlaw ganga (marihuana) farmers, which is better avoided even by resourceful locals like Speedy. The Wallilabou facilities also include a customs/immigration office that is manned one hour in the afternoon. We were puzzled to find that in the St Vincent & Grenadines nation the relatively inexpensive entering cost is followed by a check out fee. The checking in and out in every single of these micro-nations is a nuisance for the Caribbean visitor. But for Yum-Yum's part, the unpleasant meetings with grumpy or small-scale-psychopathic customs officers has been well compensated by cheerful and forthcoming people behind the counters and protocol-piles. We have definitely chosen a name for our yacht that often breaks the ice in our meetings with the Creoles. The Customs officer in Soufriere stands out as the best one so far. We had a really nice welcome-to- St. Lucia-experience in his office. From the marine park mooring at the foot of the Pitons we spent a day with walking shoes on. Our walking took us to the spectacular woods in the Piton hills, and to the sulfur-spitting dome in the volcanic center just a few kilometers from the beach. Valentine has visited the place before, and were surprised to see the wilderness just a few years back turned into a modern tourist attraction. We might have mixed feelings about this development, but here the well organized walking paths, the guide service and the good quality audiovisual presentations well defends the 20 EC$ entering fee. On our way back we picked up at Zeka's studio the four wooden decoration masks that we had selected earlier in the day. Indeed a very touristic day for us. So when we left the mooring in the afternoon, considering the wind direction and the newly appointed male skipper's yearn for night sailing, we decided to go directly to Guadeloupe. It will be repeated many times on this blog that Yum-Yum is a good sailboat. And we feel that we are becoming better and better at mastering our darling. This travel through the night and morning hours was a new opportunity to experience how the boat responds to varying wind conditions, included a little drama when our genaker suddenly started to unfurl in some heavy morning gusts. I was happy to rediscover the well known northern sky star images. Most evenings here we have a clear and great star view over us, especially the Milky Way and Jupiter catch our attention when we lie on the trampolines after sunset. But parts of the star images I know from back home is too low on the sky early in the night. We anchored just outside a marina complex south of Basse Terre. This is on the south-west corner of the island. Guadeloupe and Martinique have a very different level of infrastructure and organized society compared to the rest of the Caribbean islands. The roads looks like in Europe. A mixed variety of people take advantage of the governmental supplied or supported facilities like beach walkways, the swimming club on the beach next to us, the organized kayak activities, the very well laid out and maintained forest walkways etc. It seems that architects and designers have had many opportunities to realize their visions in both small and medium scale everywhere. All small local beach communities has a well constructed dock in its middle, obviously built and maintained by governmental resources. We rented a car for a couple of days and visited Point a Pitre, the central town, conveniently located at the southern bank of the connection between Guadeloupe's two halves. The aquarium was nice, we also had a long conference with a North Sail sailmaker who gave us advice about the new genoa we are about to order. We also had a good walk in the rainforest in the side of the volcano, and we visited a very interesting rum factory. The machinery there was really amazing, the sugar cane press is a 120 years old steam driven construction, directly fired with the squeezed canes that come out of the press. A very open machine with huge gearwheels and wide web transmission belts like something from Chaplin's Modern Times. Two of the press units were opened for maintenance, and I felt privileged to be able to inspect even the brass bushing surfaces of this very rough built, manually lubricated and extremely old (but still fully operative) piece of equipment. In Basse Terre we also found a Leader Price shop. Strange that the products from those dull looking, long cashier-que shops became the source for such a big part of the Yum-Yum supplies for the good cooking we have enjoyed on board through this Hurricane Season. We left our anchorage in heavy rain, and, for once, motored a couple of hours up to Dehaies were we spent our last night on Guadeloupe for this time.